Memorials to one of Russia's greatest writers, Anton Chekhov, have been unveiled this year in Sri Lanka, marking the 120th anniversary of his brief visit to the island and the 150th anniversary of his birth. On the initiative of the Russian ambassador, the Galle Face - one of the two famous colonial-era hotels in the capital, Colombo - inaugurated a plaque commemorating the writer. A sculpture of Chekhov was installed in the other hotel, the Grand Oriental. Documentation on his visit in November 1890 is sketchy but it is known that he sailed into Colombo on a long voyage back from the prison island of Sakhalin in the Russian Far East, having travelled out there overland. He had been there to study and write about the prisoners' living conditions. Already starting to suffer from the tuberculosis which would later kill him, he called Sakhalin "hell". He was glad to leave and to make the journey via Hong Kong and Singapore to Sri Lanka, then known by its earlier name Ceylon. "Then there was Ceylon - the place where Paradise was located. Here, in Paradise, I covered more than 100 miles by railway and was sated up to the neck with palm forests and bronze-skinned women," he wrote. The new plaque at the Galle Face hotel was made by a Russian sculptor, Gennadi Provotorov, and brought to Sri Lanka by a Russian parliamentary delegation. As it was unveiled, Russian professor and Chekhov biographer Dmitry Kapustin told me more about the writer's visit to Ceylon. "He saw tropical nature for the first time," he said. "He met very friendly people. He fell in love with a local woman and wrote [about it] in his letter." More surprisingly, he brought three mongoose from Ceylon to Russia. "They lived in his house for several years. And at last he decided to gift them to Moscow Zoo," said Prof Kapustin. 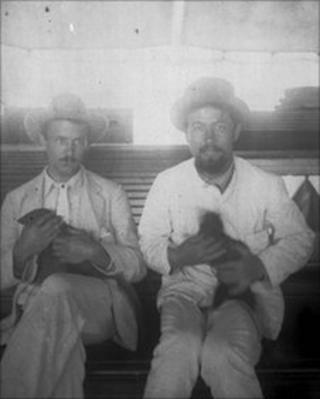 Chekhov spent just three days and two nights in Ceylon. A recently discovered hotel bill shows that he stayed his second night in the hill town of Kandy, the place where he particularly enjoyed local women's company. His first may have been spent at either of the Colombo hotels; it seems he visited both as he mentioned them in letters. "It's true we were a British colony, but I think Russian literature has surpassed even English literature," said S Karunatillake, who runs the Russian Literary Circle in Colombo. "Chekhov's short stories about Ward No. 6 and The Woman with the Dog are very popular in Sri Lanka, they are very close to our hearts." Some of his works have been translated into Sinhala and Tamil and the renowned Sri Lankan writer, Martin Wickramasinghe, has written about Chekhov's visit to Ceylon. The island left an indelible mark on Chekhov. Before he left, he started writing a famous story, Gusev, which describes the death of a soldier during a sea voyage. The story was reputedly much admired by the great Russian composer Pyotr Tchaikovsky. When Chekhov completed it he inscribed it with the dateline: "Nov 24th, 1890, Colombo".